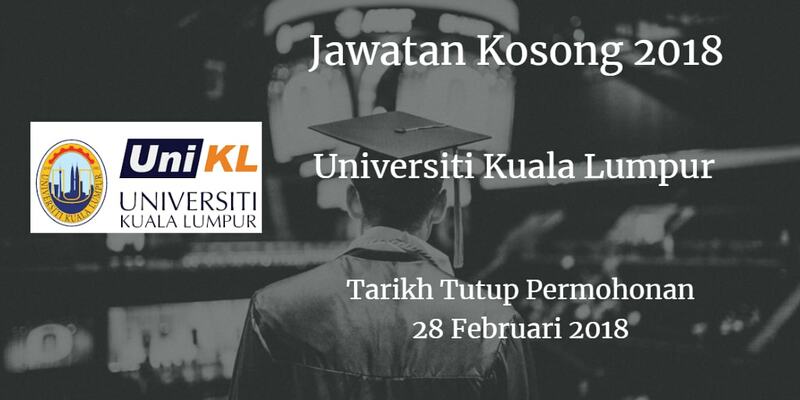 Sukacita dimaklumkan bahawa terdapat pelbagai kekosongan jawatan Universiti Kuala Lumpur ,akademik dan bukan akademik berikut. Peluang kerjaya di Universiti Kuala Lumpur . Medical Degree recognized by the Malaysia Medical Council. Experienced in medical related research activities. PhD/Master recognized by the Pharmacy Board of Malaysia. Having a Bachelor Degree in pharmacy is an additional advantage. PhD/Master/Bachelor/Diploma recognized & registered with the Nursing Board of Malaysia. Min. 5 years working experience in the related field. Having a Teaching Methodology Certificate is an additional advantage. Diploma in Chemistry/Pharmaceutical Technology or any other related disciplines. Min. 2 years working experience in handling laboratory equipment is: High Performance Liquid Chromatography (HPLC), Gas Chromatography (GS) etc. Good written & oral communication skills in English Bahasa Malaysia. Good interpersonal skills with a pleasant personality. We offer a competitive remuneration package as well as career advancement opportunities.